I want to especially thank you for the tremendous work in ushering massive tax cuts and reform through the Senate. Just happened, and we have a final step to go. And I predict we're going to be very successful. We're talking about massive, massive tax cuts. (Applause.) It's tax cuts and reform, but I always mention tax cuts first because that's what people like to hear. We're now one huge step closer to delivering to the American people the historic tax relief as a giant present for Christmas. Remember I said we're bringing Christmas back? Christmas is back, bigger and better than ever before. We're bringing Christmas back. (Applause.) And we say it now with pride. Let me just say, to those here today and all across the country: Merry Christmas to everybody. (Applause.) And also, happy holidays and a great New Year. We're going to have a great, great year. I also want to recognize your fantastic representatives who are with us -- Rob Bishop, John Curtis, Chris Stewart, and Mia Love. Thank you all. You're here. (Applause.) Thank you. Thank you. Thank you. And I have to say, really -- talk about a very special guy that I made Secretary of the Interior. Does he know the interior. He's knows it, he loves it. He loves seeing it and riding on it. 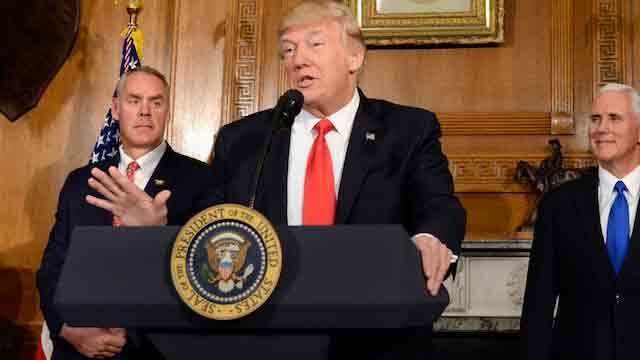 Ryan Zinke, who truly believes in protecting America -- he is protecting America. And nobody loves it more. Ryan. (Applause.) Thank you. Just as he protected America as an officer of the legendary Seal Team Six. He's a tough cookie and you've done a great job. Thank you, Ryan. Governor Gary Herbert. Where is Gary? Come on Gary. Come on, Gary. Get over there, Gary. So they can -- (applause) -- and you’re your wife, the First Lady, is fantastic. Thank you very much. First Lady. Thank you, First Lady. Finally, I want to recognize the members of the local Utah Navajo. Thank you very much. (Applause.) Thank you very much. Thank you very much. Really appreciate it. We're profoundly honored by your presence here today, and I'm thrilled to be here with so many wonderful friends, so many people that saw something a little special and they said, we're with him, and I'm really working hard to put it back. And that's what we're doing today. This magnificent capitol, in your incredible state. And it is special people in a special state. Thank you very much for being here. I've just come from touring Welfare Square with Senator Hatch and some amazing people from the leadership of the Church of Jesus Christ of the Latter-day Saints. (Applause.) Special. I spent a lot of time with them. In fact, I went around the store, I wanted a nice can of tuna fish -- (laughter) -- and they had plenty. They really help people. Incredible. After our visit, I can truly say firsthand that Utah’s awesome natural beauty is exceeded only by the warmth and grace and hospitality of its citizens. This state has many natural treasures, but its greatest treasure by far is its people. (Applause.) And we will ensure the right of the people to live according to the faith in their hearts, which is why we will always protect your religious liberty. (Applause.) And we've been doing that. And that is why I'm here today: Because some people think that the natural resources of Utah should be controlled by a small handful of very distant bureaucrats located in Washington. And guess what? They're wrong. Your timeless bond with the outdoors should not be replaced with the whims of regulators thousands and thousands of miles away. They don't know your land, and truly, they don't care for your land like you do. (Applause). But from now on, that won't matter. I've come to Utah to take a very historic action to reverse federal overreach and restore the rights of this land to your citizens. (Applause.) Thank you. Thank you. Thank you. But before I began -- because I understood how big it is -- I'm a real estate developer. When they start talking about millions of acres, I say, say it again? That's a lot. So, before I began, I met with Senator Orrin Hatch, who loves Utah and loves the people of Utah. I called Senator Mike Lee, who loves Utah and loves the people of Utah. I called your governor. I called my original -- where is he? There he is. I called all of the friends that I have in Utah. I said, what do you think? I said, will this be good for our country, and will it be good for your state? They said this would be incredible for our country, will be incredible for Utah. Finally, you would be giving people back their access to the land they know, to the land they understand, and most importantly, to the land that they love. I also said, will it be at all controversial? They all told me no. (Laughter.) How did that happen? I don't think it is controversial, actually. I think it's so sensible. For example, the previous administration designated more than a half a billion acres of land and water, including Bears Ears. It did so over the loud objections of the people of this state and their elected representatives. Governor -- right? The results have been very sad and very predictable. Here, and in other affected states, we have seen harmful and unnecessary restrictions on hunting, ranching, and responsible economic development. We have seen grazing restrictions prevent ranching families from passing their businesses and beloved heritage on to the children -- the children that they love. We've seen many rural families stopped from enjoying their outdoor activities. And the fact they've done it all their lives made no difference to the bureaucrats in Washington. These abuses of the Antiquities Act have not just threatened your local economies; they've threatened your very way of life. They've threatened your hearts. With the action I’m taking today, we will not only give back your voice over the use of this land, we will also restore your access and your enjoyment. Public lands will once again be for public use -- (applause) -- because we know that people who are free to use their land and enjoy their land are the people most determined to conserve their land. One values the splendor of Utah more than -- I’ll tell you what, there’s nobody out there. I just came in, and I’m looking around with Orrin and with Mike and with the governor and with everybody, and I’m just saying, what a beautiful picture it is. But no one values the splendor of Utah more than you do, and no one knows better how to use it.